Nashik, approximately four hours northeast of Mumbai in Maharashtra, is a city with a dual identity. On one hand, it's an ancient and sacred pilgrimage destination with a fascinating Old City. On the other, it's home to the biggest winery region in India. Nashik is closely associated with the Hindu epic the Ramayana, which tells the story of Lord Ram. According to mythology, Ram (along with Sita and Lakshman) made Nashik his home during his 14 years of exile from Ayodhya. They lived in the area now known as "Panchavati". The city gets its name from an incident whereby Lakshman cut off the nose of Surpanakha, the sister of demon Ravan, after she tried to seduce Ram. These top places to visit in Nashik reflect the city's diversity. An inexpensive full-day Nashik Darshan bus tour departs from the Central Bus Stand at 7.30 am and visits many of the city's attractions including Trimbak. It's best to book the tour at the bus stand the day before. Do note that it comes with a Hindi-speaking guide only. However, it's a great local experience! In the heart of Nashik's Old City, Ramkund ghat attracts both pilgrims and tourists to its holy waters. Lord Ram bathed and performed the death rituals of his father there. Hence, many people come to immerse the ashes of their departed loved ones, to help their souls obtain liberation. The tank was built in 1696 and although it's unfortunately quite dirty and not well maintained, it's an atmospheric and absorbing place to spend some time. The adjoining vibrant vegetable market is worth exploring too. 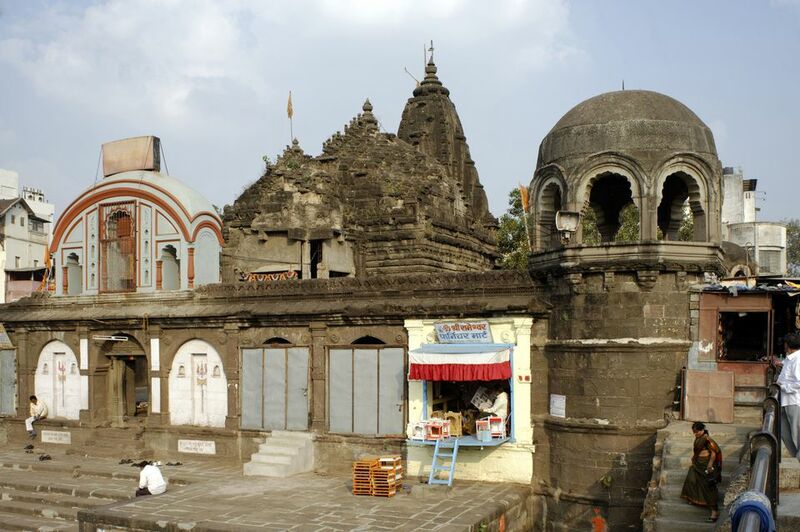 There are as many as 100 temples in Nashik. Many of them can be found near the holy Godavari River, which flows through the city. The city's most sacred shrine, the beautiful black stone Kala Ram temple, is uphill to the east of Ramkund. It supposedly stands right where Lakshman performed the slicing of Surpanakha's nose. Nearby is Sita Gumpha, a claustrophobic cave where Sita is said to have hid from Ravan. There are some doubts as to its authenticity though. On the way there, stop by Naroshankar temple, which is close to Ramkund. Kapileswara is another famous temple in the area. It's a Shiva temple but the nandi (bull) is unusually missing from it. In the opposite direction, Sundar Narayan temple is situated next to Victoria Bridge and offers a fabulous view of the Godavari River. Dedicated to Lord Vishnu, it's a spacious complex with splendid architecture. Buddhism has also left its mark in Nashik with 24 rock-cut caves that date back to the 2nd century BC. Inscriptions indicate that most of the construction happened during 2nd century AD and that the caves were occupied up until the 7th century AD. Following the decline of Buddhism, Jain monks began inhabiting the caves and contributed to their structure. Funding for the caves was provided generously by the rulers of the Satavahana dynasty, along with donations from people of all walks of life. The main cave, number 18, is a prayer hall with a stupa. The other caves that hold the most interest are three and 10. Cave three is notable for its sculptures of idols, while cave 10 is structurally intact along with its inscriptions. It's believed to be as old as the Karla Caves near Lonavala in Maharashtra. The Pandavleni Caves are located around 10 kilometers southwest of Nashik, just off the Mumbai-Nashik Highway. Visit early in the morning before it gets hot, as it's a 30-minute uphill trek. Plus, the caves face east and their carvings are illuminated by the morning sun. There's an entry fee of 15 rupees for Indians and 200 rupees for foreigners. Wine tourism is the new buzzword in Nashik. There are almost 50 vineyards in and around Nashik, and many now have tasting rooms, restaurants and accommodations for guests. What's also appealing is that discounts of 10-20% on retail price are available on purchases. The vineyards fan out in all directions from Nashik though, so you'll need a car to reach them. Either that or take a wine tour. Head to Sanjegaon district (30 kilometers before Nashik), Dindori district (30 kilometers north of Nashik), and Gangapur Dam (10 kilometers west of Nashik). Trimbakeshwar temple, around 30 kilometers west of Nashik, is particularly revered and popular with pilgrims. This temple is one of the 12 jyotirlinga shrines of Lord Shiva, where he appeared as a pillar of light. Its substantial stone exterior is covered with intricate sculptures. Most of the action of the Nashik Kumbh Mela happens in the vicinity of the temple. If you're into hiking, Brahmagiri Hill is worth the climb. The source of the holy Godavari River is in the Brahmagiri range. Alternatively, if you have kids, Shubham Water World is a fun place to take them on the way to Trimbakeshwar from Nashik. There's a small coin museum en-route to Trimbakeshwar as well. It's part of the Indian Institute of Research in Numismatic Studies campus.